Spooky Pooky Creations: Busy, Busy, Busy!!! I am afraid I am not keeping up with my blogging. But the wedding is in less than two months, so I don't think I need to tell you guys where I have been! Plus, a week from tomorrow (Sunday), I will be only a few feet away from Meat Loaf, rocking out like nobody has rocked out before. I can't even talk about it. Seriously. Let's see, I have been so. incredibly. busy. I mean, seriously. It is nuts. I am soooooo tired and stressed, but not in a bad way. It is all very exciting, but I can honestly say I am just as excited for the wedding to be over as I am for the wedding! lol...not in a bad way, I am just looking forward to relaxing and not doing anything for a little while! Right now, I have either been running around town buying and pricing things for the wedding or sitting at home making things for it. And I have made TONS! I can't wait to see it all come together. 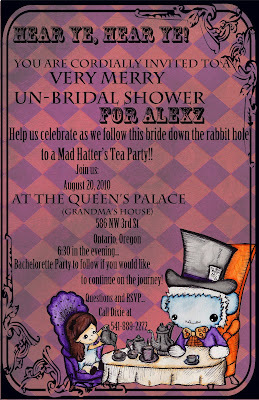 For now, here are my bridal shower invitations. 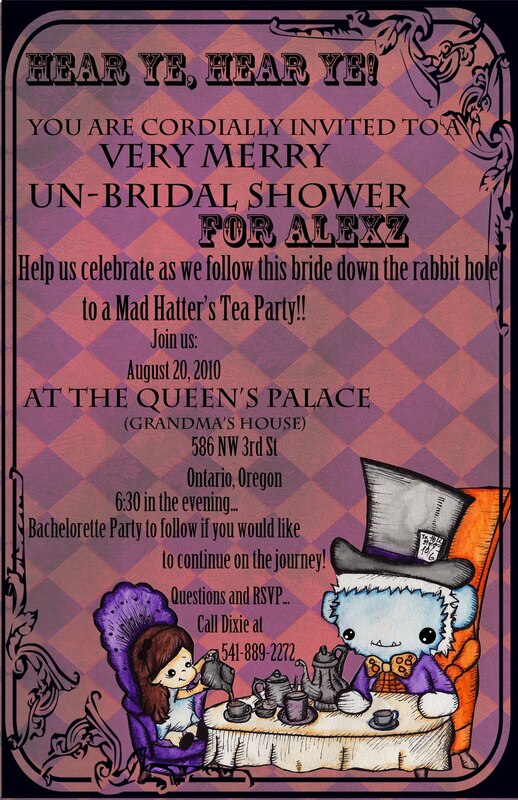 My Aunt asked me what I wanted the theme to be so I asked for a Mad Tea Party and then she asked me to include my yeti in the invitations (like she had to ask!). I love the invite, so cute. Hope you have fun and don't get too stressed out over wedding matters.